There's a great debate going on when it comes to the finishing process for common outdoor wooden structures. Should you use paint or stain to keep your deck, fence, or porch looking its best? In general, professionals recommend staining rather than painting, although paint can be used with caution. Find out why. Your porch or deck floor has to stand up to a lot of heavy foot traffic -- as well as the harrowing effects of winter freeze-thaw cycles, which cause the wood to alternately contract and expand, and harsh summer sun. All this can cause ugly bubbling, peeling, chipping, and cracking of painted surfaces. But even more important, painting deck, porch, and fence wood is different from, say, touching up the wooden siding on your house. When you paint siding, you have to cover just one conveniently vertical surface. Contrast that with the six exposed sides of each piece of lumber. If every one of those sides is not covered with paint, you'll be asking for trouble ... in the form of moisture. When an area is accidentally or purposely left unpainted, it absorbs moisture that the paint will then prevent from escaping. This may lead to the wood rotting from the inside, which is very difficult to detect. Scrape and sand to remove all damaged paint. Clean the surfaces thoroughly. A pressure washer is the best tool for the job, but use only according to the manufacturer's instructions. Make sure the wood has dried completely -- a matter of at least 2-3 days -- and the weather forecast is for clear, mild weather before you move on. If pieces of wood are joined in such a way that they can't be painted individually, caulk the joint well to increase water resistance. Put on a coat of good oil-based primer. Apply a quality oil-based paint. Stain provides penetrating moisture protection while allowing the wood to "breathe." It also shows off the natural beauty of the wood grain. Transparent stain looks great on newly installed wood, although it does need to be redone frequently to keep its handsome appearance. Once some weathering has taken place, more durable semi-transparent stain, which has a little color to it, will be preferable. 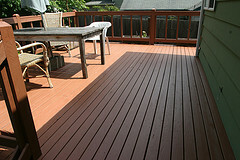 When your deck or porch is showing definite weathering, a more deeply pigmented solid stain is recommended. Before applying any type of stain to a brand new installation, check for a moisture content of less than 12 percent in the wood; if higher, wait for several weeks and test again. An existing structure should be cleaned well and allowed to dry as described above. SAFETY PRECAUTION: Outdoor construction prior to 2004 may have used lumber which was treated with chromated copper arsenate (CCA). Sanding this kind of wood will tend to disperse poisonous arsenic particles in the air and must be done by a knowledgeable professional. Use a top quality stain -- it will last approximately three times as long as an inferior one. Spray or roll the product on -- using a roller with a nap of 1/4" or less to prevent pooling. Simply brushing will fail to cover adequately. Never apply stain when the sun is strong, as it will dry too quickly. Instead, start the project as soon as the dew dries in the morning. Take a break from about 11 AM to 3 PM before completing the chore. Do Non-VOC Paints Cost More than Paints with VOCs?